The generic standard for AC power connectors in North America is ANSI/NEMA WD 6-2012. It defines believe it or not, about 150 different styles. That’s why wiring the plugs or cords may be confusing to the users. Luckily, only a handful of outlet types are practically used in portable generators. 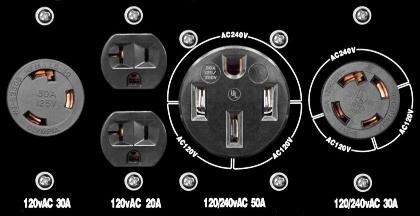 Usually, in addition to conventional 120V outlets they provide one or several different high-current receptacles. Above image shows as an example the receptacles used in 10kW Duromax XP10000. The chart below provides wiring configurations of common single-phase generator outlets and plugs. 1. In the above diagrams X and Y- electrically hot wires (usually red and black), W – neutral (white), G- ground (green). 2. Plugs and outlets are shown front view (pin side). 3. Wire sizes are approximate. You need to take into account the temperature and the length of the cable. 4.The extension cables are used only in portables for temporary use. Standby home generators are normally hooked up to a transfer panel, which is connected permanently to the house wiring.